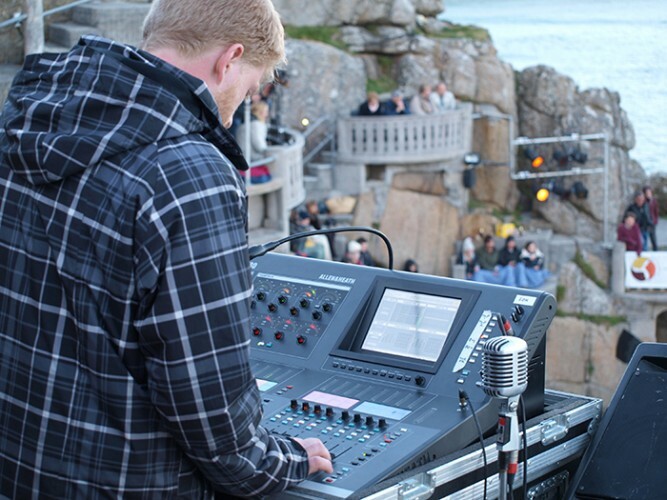 Two Allen & Heath iLive digital mixing systems managed FOH and monitors for a special performance by the band, People’s String Foundation, held at the Minack open-air theatre in Cornwall to mark a forthcoming album launch. The 12-strong band debuted all tracks from its new album, due for release this summer, accompanied by a ten-piece orchestra. 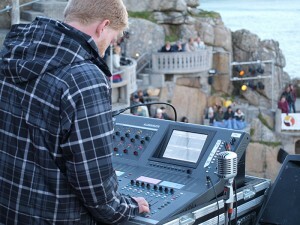 "Positioned on a cliff top, the open-air amphitheatre was a logistical challenge, requiring a mixer that would fit with the rest of the PA in a van small enough to negotiate the narrow lanes leading to the venue but could also handle the 50 plus channel count," comments FOH engineer, Tommy Williams. An iLive-T80 surface with iDR-48 MixRack was selected at Monitors, expanded with an xDR-16 to handle the microphones from the string section. The xDR expander had an M-MADI card fitted for multi-track recording of the show on a Soundscape DAW. The other ACE link from the iDR-48 fed the FOH system, comprising an iDR-16 on stage and a T-80 on the upper terrace. The iDR-48 was set up with 8 wedge mix outputs and 6 stereo in-ear mixes, to cater for extra requirements and supporting acts. In addition, two ME-1 personal mixers were used on stage by the drummer and bassist. The ME-1s received a premix by the Monitor engineer, plus a separate mix of the drums and individual vocals, so that the musicians could dial in what they needed on top of the default mix from the iLive. "Due to acoustics and integration of the PA with the resident delay speakers, I mixed the gig from my iPad most of the time. The ability to walk all the way up to the upper terrace, or sit down with the audience close to stage was key in setting up the delays, tuning the system and getting the mix balance right," comments Williams. In picture: the FOH iLive surface with engineer, Tommy Wiliams.